Medicinal cannabis can basically be used in two ways: by ingestion (oral) or by inhalation (pulmonal). Oral administration includes edibles, tinctures and tea. Inhalation is possible by smoking and vaporizing. There is a big difference between these two modes of administration. When heating cannabis during smoking or vaporizing, the active (medicinal) constituents are released in the form of a vapor. During inhalation these compounds are quickly and efficiently absorbed by the lungs, and taken up into the bloodstream. As a result, effects can already be noted after just a few minutes, and symptoms can be treated quickly. This is a great advantage for patients suffering from acute problems, such as migraine, or muscle spasms associated with MS. The effects of inhaled cannabis last shorter than orally used cannabis: after about 2-4 hours the active compounds are cleared from the bloodstream, and the effect is over. Some users believe than holding the smoke (or vapor) in your lungs (holding your breath) for 10 seconds increases the uptake of active ingredients, but this has not been confirmed in any studies. Smoking cannabis is a rapid and efficient method to administer cannabis, but it is not really the healthiest way. Smoking of cannabis for medicinal use is therefore not recommended. Clearly, it would be ideal to be able to inhale cannabis without the presence of smoke. With a high quality cannabis vaporizer this is possible. You can find more information on vaporizing here. When cannabis is ingested (edibles or tea), it will typically take 1-2 hours before the active ingredients have reached the bloodstream. It therefore takes a while before the first positive effects may be noted. Tea is a very easy and reliable way of using cannabis orally. You can find some tips on how to make cannabis tea here. The effects of cannabis after oral administration last for 4-8 hours, much longer than after inhalation. Consequently, oral use of cannabis is well suited for treating complaints of a more steady nature, such as Tourette syndrome, or chronic pain. Treatment could start with 1 or 2 cups of cannabis tea daily, on set times of the day. 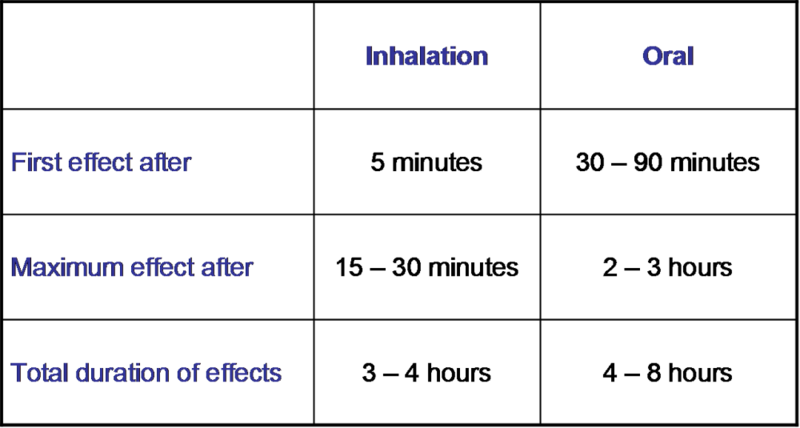 The table below summarizes the different effects of inhaled versus oral use of cannabis. Almost each form of cannabis administration includes some form of heating. After all, cannabis is burnt for smoking, heated for vaporizing, baked for cookies, or boiled for tea. The reason for this is that the cannabis plant contains a number of ingredients that need to be ‘activated’ by heat before they will show their medicinal properties. For those who care to know, we can talk some chemistry here. Fresh cannabis plant material does not contain any THC at all. Instead, what is actually present is THC-acid, a slightly different form of THC without any of its narcotic effects. When plant material is properly heated (smoking, vaporizing, baking etc.) THC-acid is rapidly converted into THC. The same is true for some other cannabinoids with important medicinal properties: CBD is actually present in the form of CBD-acid, which is converted under the influence of heat, etc. This conversion process is called decarboxylation. It should be noted that too much heat may lead to degradation of active ingredients.